Yelling above the noisy Vanderbilt Law and Music Row crowd, a close friend and I were debriefing each other on life’s events over happy hour martinis—hers Lemondrop, mine Dirty. For now, this midtown bar was excruciatingly pleased with its hip status. At the time, my hometown Nashville was gearing up for the explosion of It-City Self-Regard that would soon clog its roadways, microbreweries, and real estate market. Soon this bar would bend to changing conditions. Not long after that, it would disappear. Our friendship would one day do the same, but for now she and I were also excruciatingly pleased with ourselves. So close were we, in fact, that when she said, “The thing about you is,” I leaned forward with genuine interest. The thing about me was this: when it came to everything in life that faces outward—the sensibilities that help us discern what paths we’ll pursue, what permissions we have to access the world, what roles we might play within cultural and educational institutions—I possessed a thoroughly urban outlook. As she continued on to the sophisticated point she was making, I stopped chewing martini olives and stared into space. For her, this observation was mere aside, but in truth she’d handed me pure gold. She’d given me an organizing principle for how I move through the world, how I live on the page. These two realms—the Podunk and the City—exert equal power over me, each working full-time to fuel my point of view. For years, I did believe I had to choose. Most of us harbor romantic fantasies about the writers we’ll be. I knew I’d write Southern fiction, no question. But I figured myself for a Southern writer who’d shake off the Podunk for glittering Northern Cities. In my twenties I gave that persona a shot—up to grad school at Sarah Lawrence and the NYC landscape. What came next was suffocation I’d never known, a longing not only for woods and fields, but for voices of those I’d left—even those who spoke words I despised. I was learning to use my materials, yes, but life in the faraway city was teaching me something else: how deeply the backwaters of home had nourished me. Surrounded by pavement and noise for too long, I was compromised. 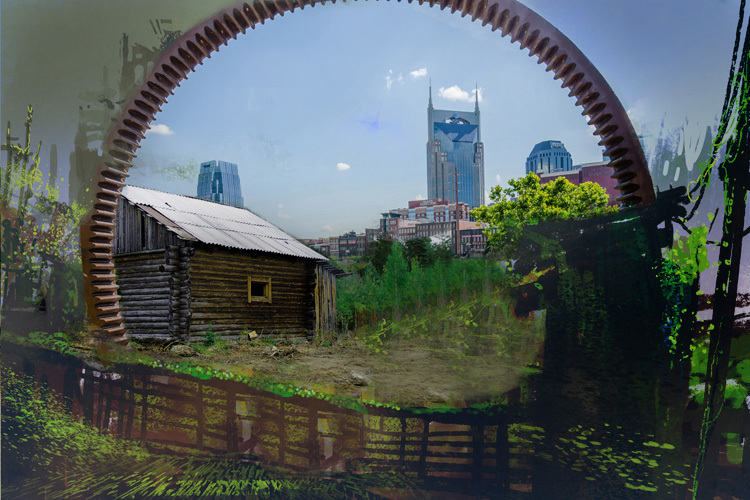 Last fall, I returned to the heart of the city after a decade of living in the hinterlands southwest of Nashville, not far from William Gay territory and the strange country hollow where my Dad grew up, where I’d been drawn as if magnetized since childhood. Wrigley was made of the stuff that grows Southern writers: dark, secret-strewn woods concealing the community lifeblood—a charcoal briquette plant. Its modest homes were filled with generous, industrious workers, and a gaggle of murderous weirdoes. The house I rented sat in a ridgetop field, surrounded by abundant, nurturing woods, which slowly began to reclaim the house—increasing critter incursions, portions of the house sinking into the ground, that kind of thing. Once my own health began to erode, the time came to move. But I am, by constitution, incapable of choosing one realm. Stranded in the wilds or cooped up in the city—always I feel the lure of the other. I’m no longer looking to choose. The point may not be so much about where we set up camp, as much as opening ourselves toward greater attention, wherever we happen to be. To growing ever more awake to the small scrap of world around us in the present. To breathing deeper as we ask: “Do we know where it is that we stand?” The writer I am breathes that deeper breath through an inseparable pair of lungs—one for the city, one for the Podunk. Em, you sort of had the best of both worlds when you lived in that little apartment overlooking Lipscomb and Granny White Pike, n’est-ce pas?